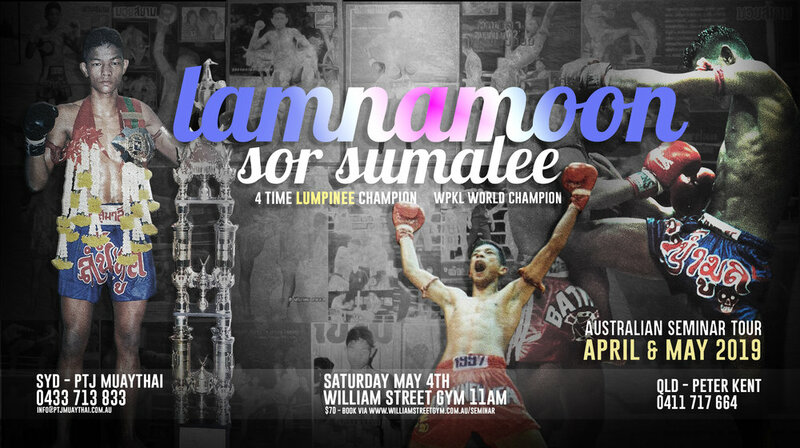 2-Hour Seminar (Plus Question Time and Photo Opportunity) with legendary golden era Muaythai Champion, Lamnammoon Sor Sumalee. A multiple-time Lumpinee and World Champion and now the owner and head trainer of Lamnammoon Muaythai. Australian and Rebellion Muaythai fans will also know him as the Thai trainer of Kurtis Staiti and the late Jordan Coe. “After finishing his fight career Lamnammoon began teaching first working at Sor Sumalee then moving onto schools in Macua, Australia, and at Evolve Mixed Martial Arts in Singapore where he trained Raphael Dos Anjos and Zorobel Moiera. After several years in Singapore, Lamnammoon decided to return to his roots in the heartland of Muay Thai in northeast Thailand. In developing his fight team he brought one of his original foreign students from Sor Sumalee gym, Sean Kearney. He was able to get the Canadian fighter rankings at both Omnoi and Lumpinees stadiums as well as other wins around Asia. Although Lamnammoon was known for his walk forward, clinch and knee style he enjoys teaching all styles of fighting preferring to adapt to his students’ body types and temperaments.